I know there are teachers out there who insist that having good rapport with your students is somehow important. They say that a good rapport can be the difference between a class that is out-of-control and one that respects and listens to you. Or that once you develop a good rapport with a student, you may be amazed how dedicated and loyal they become. But I’m just not sure I believe them. I think a good rapport is extremely overrated. And furthermore, it just might be something you need to avoid at all cost. 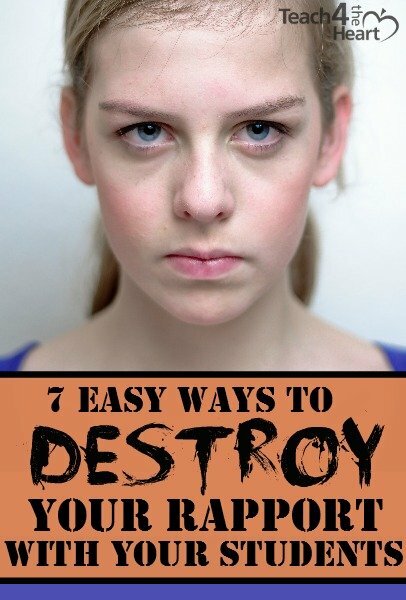 To that end, I’ve provided you with 7 easy ways that you can destroy any rapport you might have built up with your students. Make sure you’re always right. If you want to frustrate your students, make sure you always insist you’re right, even when you’re wrong. And never apologize when you make a mistake or lose your temper. Cut off all avenues of appeal. Don’t let your students appeal any of your decisions. You are the teacher and the authority, so you’d better not let them question you. Ever. Never laugh (especially at yourself). If you want to be taken seriously, never smile. Never use humor. And, above all, never laugh at yourself. Turn in students for discipline without talking to them. If you really want to get a student mad at you, just turn in their name for a detention without saying anything to them. The look on their unsuspecting face when they receive the slip from the office will be priceless! Yell at your students. This is a great one. Next time your students are misbehaving, just scream at them and go off on a huge rant. That’s a sure bet to kill your rapport in a heartbeat. Especially if you remember rule #1. Put on a facade. This is the most powerful way to destroy your rapport, and while it might not make a big difference right away, stick with it and it will definitely pay off. All you’ve gotta’ do is pretend to be something you’re not. Or hold your students to different standards than you have for yourself. Rapport-destroying gold! And, above all, never ever waste your time on a training like Beyond Classroom Management. Just look at it! 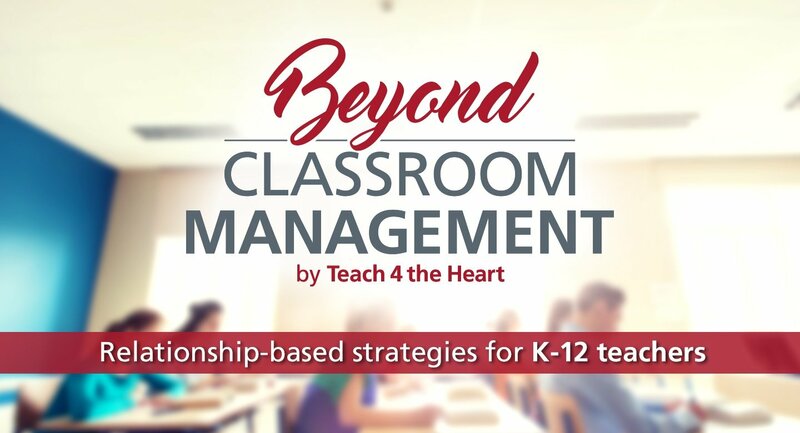 To think that strong relationships could actually lead your students to be respectful, responsible, and engaged? Ha! Ridiculous. I really hope this post is tongue in cheek. Yeah. I keep looking for The Onion logo. Be defensive every time a parent asks a question.You want to make sure they understand that parents are adversaries and cooperation will not be an option.Students should be afraid of retaliation if parents try to get involved. If you want to be a super cool teacher, you should delve into your students’ personal business. When my niece was absent one day in middle school, the teacher was sure to tell her how another girl was flirting with her boyfriend. She also insisted that the two girls go out in the hall to “fight” it out. Twelve years later, she certainly was not invited to the couples wedding. Great advice, Beth. As ALWAYS I’m soooooooooo proud of you. Great advice, Beth. As always, I’m so proud of you! Love you, mom. Looking forward to your ideas on how to manage my class more effectively.